The origins of the Pug can be dated back to the Shang Dynasty in Eastern China around 400 BC. From there this popular little dog spread to Tibet, Japan and finally to Europe around the 16th and 17th centuries. During that time, the appearance of the Pug has altered considerably. Today the Pug is a short, muscular, cobby or square little dog with its length being more or less equal to its height. But back around the 16th and 17th centuries when it was first imported into Europe by the Dutch, the Pug was much leaner and longer. Early paintings depict the Pug as looking much more like a miniature mastiff. The Pug that we know and love today bears little resemblance to the original dog brought from China to The Netherlands by sailors of the Dutch East Indies Trading Company. For that reason, when first introduced to England from The Netherlands the Pug was frequently referred to as the Dutch Pug or Dutch Mastiff, its shape and wrinkled face bearing an uncanny resemblance to a small mastiff. Set side by side today, the two would hardly be recognised as being the same breed of dog! While its true origins can never be known for certain, we can clearly see why the Pug has such a regal air. In its native China, it was the lap dog of preference for numerous Chinese emperors. In The Netherlands, the Pug was adopted by the House of Orange, where in 1572 one saved the life of the Prince of Orange by barking at a would-be assassin and thus alerting the prince to the approaching danger. When William III (William of Orange), travelled to England to ascend the British throne in 1688, he brought with him and introduced the Pug to England and the rest of Europe. Pugs later became popular with Queen Victoria who was instrumental in the establishment of The Kennel Club in the United Kingdom in 1873. 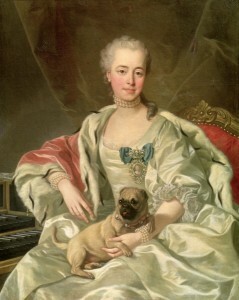 She became a dedicated breeder of Pugs. The Pug was introduced to the United States during the 19th Century where it was recognized as a breed by the American Kennel Club in 1885.